Higher price of Harvest due to meticulous recreation of original jacket. A quadruple Platinum No. 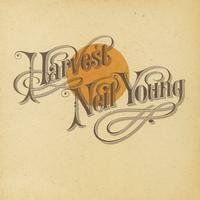 1 smash and the best-selling album of 1972, Harvest was Neil Young's fourth solo effort. With the Gold No. 1 "Heart Of Gold," Top 40 "Old Man," powerful "The Needle And The Damage Done," controversial "A Man Needs A Maid" and "Southern Man" companion "Alabama," Harvest won inclusion in Rolling Stone's "100 Greatest Albums Of All Time." Deceptively laid-back-sounding country-rock plaints like "Out On The Weekend" and the title cut caress the ear unassumingly, pulling you into the more ominous subtext that is present in the rollicking "Are You Ready For The Country." As always, Young has an ear for contrasts, laying down heavy rock ("Alabama") besides his balladry, and even employing the London Symphony Orchestra on the excellent confessional "A Man Needs A Maid." Due to back troubles, Young recorded much of this material while wearing a brace, a fact that seems audible in the tension and unease that underlies the friendly, acoustic surface of this superb release. GOOD NEWS: THERE'S MORE! Also reissued from the original analog master tapes in this same meticulous fashion are Neil Young, Everybody Knows This Is Nowhere and After The Gold Rush. Don't miss any of these classics. Sounds very good, although I´ve never listened to the original issue. No comparison to mp3´s. That much I can say. Packaged very nicely. Mine spins smoothly, and this is not 180g version. I plan to buy the other albums from this issue as well. Amazing! I have never heard Neil sound this good. I don't have OP. My copy was a little warped but no big deal. Rating it 4.75. I waited until I found an original pressing to compare the re-issue to before writing a review. The new pressing is quiet, warm, fat and sounds very very good. The original is not quite as "big", but close. It does however have slightly more transparency. For example the background vocals in Old Man sound just slightly hard on the re-issue while they're more liquid on the original. The piano (same track) has slightly more harmonic overtones. The harmonica on Heart of Gold has the slightest touch of glare on the new recording but on the original sounds nuanced. These are very small differences however and aren't likely to be noticed on most systems. I would guess the difference is simply the age of the master tapes. When I listen to this album I'll probably pull out the new one due to the high quality and quietness of the vinyl. Reviewed on a Steelhead/Revel/Proceed/Benz system. I know there are folks out there who will disagree with me, but this is my favourite Neil Young album ever made. The sparcity of the tracks i.e. Neil with just piano or guitar. Then the bombastity of the London Philharmonic Orchestra. This record has it all. When I dropped the needle and "Out On The Weekend" started, I thought I was gonna cry, it sounded that good. Now I just want more. Great job of mastering this album. This sounded excellent. It compared favorably to my DVD-A version. Very full sound, only a few pops and clicks. To be honest, I was skeptical when I first heard about the Neil Young reissues. While many recent vinyl pressings have been fantastic, many have also been disappointing. Poor pressing quality seems to be a big problem nowadays. Well, this reissue is simply superb. The sonics are breathtaking (a great LP to show off your system and/or demonstrate the superiority of analogue music), and the pressing is truly flawless. Congratulations and a big thank you to Neil Young and the group who worked on this reissue. They've set the standard. Truth be told, listening to this LP gave me goosebumps and damn near moved me to tears. Stunning.